We have stories to tell! Come visit awhile and wander the grounds of two welcoming sites in the countryside near Vevay, Indiana that reflect the rural nature of the area and its history. Meet some folks and hear their stories about the early life, music and trades of the French-Swiss settlers who made Switzerland County their home. The Rural Heritage Tour will take place Saturday, October 6th from 10 am to 5 pm and Sunday, the 7th from noon to 5 pm at two National Historic Register sites ~ Musee de Venoge and the Thiebaud Farmstead. Musee de Venoge at 4085 Hwy 129 is one of the few remaining examples of French colonial architecture once common in Switzerland County in the early 1800s. A big favorite at Venoge is the fresh pressed cider from local apples, hearthside cheese making, and baking pies and breads in the outdoor bake oven. At the Thiebaud Farmstead at 5147 East State Road 56, an 1850s Greek Revival house restoration, the daily activities of hearth cooking, laundry and sewing are entertaining in contrast to today’s households. Furniture making, a working forge and an operating hay press barn are among the activities of the day. Period music and dance lends merriment to the day at both sites. An added highlight this year is an old-fashioned Barn Dance at the Thiebaud barn on Saturday evening at 5:30 pm. Bring your dancin’ shoes! 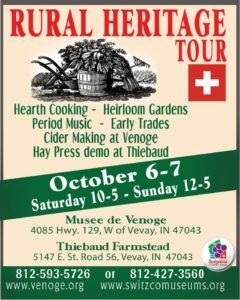 Rural Heritage Tour 2018 is sponsored by the Switzerland County Historical Society and Musee de Venoge, made possible through the generous support of Switzerland County Tourism. No admission charge but donations are greatly appreciated. For further information contact: www.switzcomuseums.org or www.venoge.org or call 812-427-3560 or 812-593-5726.